Catherine Wolfram is an associate professor of business administration at the Haas School of Business and co-executive director of the Center for Energy and Environmental Innovation at Berkeley. She also is a researcher at the UC Energy Institute, a research associate of the National Bureau of Economic Research and an affiliated faculty member in the agriculture and resource economics department and the energy and resources group at Berkeley. 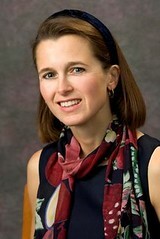 Her research focuses on the economics of energy markets. She has studied electricity industry privatization and restructuring around the world, assessing the performance of competitive wholesale electricity markets and the effects of restructuring on generation efficiency. Her recent work considers the effects of environmental regulation, including climate change mitigation policies, on the energy sector. She received a Ph.D. in economics from MIT. Before joining the faculty at UC Berkeley, she was an assistant professor of economics at Harvard University. More information about Wolfram is available through the UC Haas website.